I’m not going to lie. I’m a little embarrassed to share this story because I feel like a complete idiot. Like total brainless-scarecrow-from-Wizard-of-Oz moment. *takes deep breath* Here I go. Wednesday night I was working on my blog (what else would I be doing on a summer night?!) and was trying to find a good stock photo for a post. Immediately when I hit download, a huge red window popped up and said my computer had been compromised and I had gotten a virus. Sub-story: I’ve never had a PC until this year and am still getting adjusted to the differences between Macs and PCs. Along with this big red window was a smaller window that looked like many other Microsoft pop ups I’ve seen that had a number to call to fix the problem. I was unable to exit out of either of the windows so I called the number. (MISTAKE #1) A man answered and was very nice and said he’d seen this problem before, he wanted to remotely access my computer and explained how I could go about doing this (MISTAKE #2). He accessed my computer while I was still on the phone with him and I could see exactly what he was doing from my end. He checked my software and settings and such and claimed he saw the problem. He explained that I could take it in to Best Buy or another tech support but it would take them 3-4 days and would cost me $250+. His other option was to allow his “third level” IT guys access my computer that night and they would fix it in 3-4 hours for $199. Seeing as I work from my computer and use it practically all day, I agreed to option #1 (MISTAKE #3). You’re probably all cringing by now thinking I’m an idiot. Well, I am. I know. But I was home alone (my father usually deals with issues like this), I was scared and I was desperate. So, I gave this stranger my credit card number, my name, and my address for billing purposes (MISTAKES #4, 5 & 6). I was iffy giving him my credit card number but how else would I pay him?! (Well, Emma, maybe you shouldn’t have at all) He said I would be able to watch the IT guys do their work from my computer as they were remote accessing it and such, so that gave me a little faith. I thanked the man and felt I had done the adult thing by solving my own problem. Little did I know, I had just created a much bigger problem. When my father got home, I explained what happened and he (the one with the brain) knew immediately I had been scammed. However, none of us were sure, so we ignored it (MISTAKE #7) and headed out to dinner. When we returned we checked my computer, and practically no work had been done. I was getting more nervous and began googling to see if I had, in fact, been scammed. Welp, I had. My mom immediately called the lovely Bank of America and alerted them of the fraud and had them cancel my credit card (a small price to pay for the safety of my identity). I called Geek Squad ASAP to get the scammers out of my computer. This is the scariest part. As I was on the phone with Geek Squad and the “geek” was remote accessing my computer (yes I’m aware this is the same scenario as the scammers, but I trust Geek Squad a little more), the scammer was also remote accessing my computer and opened my “note pad” app and began typing me a message asking “if he could continue his work.” (Aka a scene from a modern murder movie.) Both the “geek” and I were completely freaked out and I exited the program he was working from. We think that did the trick but I was still spooked. I refused to pay for another service over the phone, which the “geek” understood and I turned off the computer for the night. Thursday morning I took my laptop to my local Best Buy Geek Squad and explained the problem. Luckily, the man said this has happened before and usually the men are just after the money and will actually fix the virus, just the way a door-to-door sales man would go looking for work. Basically they hacked my computer just to fix it. Crazy what some people will do for a buck (or 200). Just to be safe I left my computer with the “squad” for the day, and luckily they came up with nothing. Long story short: your computer will never give you a third-party number to call to “fix” a problem. And don’t give your credit card number over the phone to anyone who you are not completely, 100% confident in. Because this really freaked me out and realized how good scammers are, I’ve come up with some common internet scams and how you can recognize them. Stay safe internet-addicts! I genuinely hope I helped someone avoid making the same mistake I did! 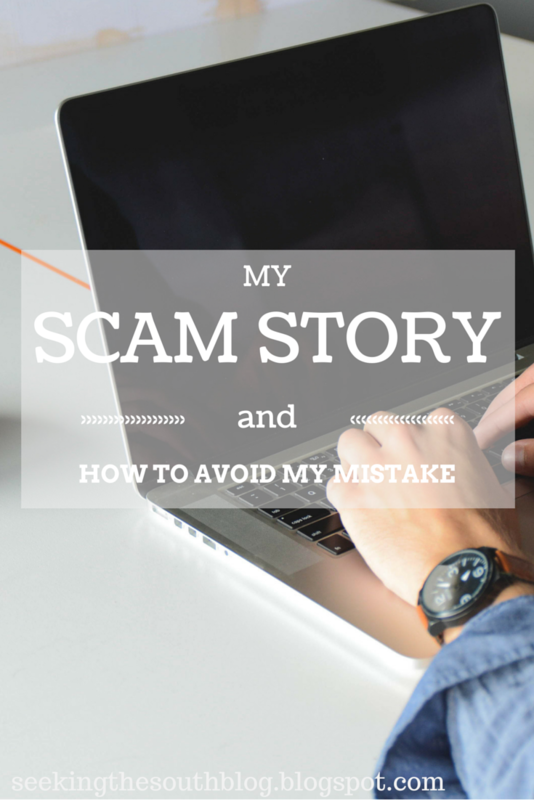 Please be careful with what you put on the internet (they’re not all fun bloggers like me!). Never ever, ever put your social security number online. Even if it’s a trusted source. And never open an email or a link in an email you’re questioning! Have you ever been scammed like I was? Comment below and tell me your story!